DOYLESTOWN, Pa. -- A jailed man who has been the focus of an investigation into the disappearances of four men admitted on Thursday that he killed them and agreed to plead guilty to four murder counts, his attorney said in a surprise development. Law enforcement officials say DiNardo suffers from schizophrenia, CBS News' DeMarco Morgan reports. Investigators have not yet released a motive for the crime at this time. But a person with first-hand knowledge of DiNardo's confession told the Associated Press the man killed them separately after selling them marijuana and then burned their bodies at his family's farm. The mystery of the four men's disappearances has transfixed the Philadelphia area over the past week, taking a grisly turn when human remains were discovered in a 12½-foot-deep grave on a farm. But what sort of evil befell them, and why, had remained shrouded in secrecy. District Attorney Matthew Weintraub parried one question after another by saying he couldn't -- or wouldn't -- answer. Police were back at the farm Thursday, digging away in the dust and the 90-degree-plus heat and using plywood to shore up the deep, tent-covered trench that they excavated at the spot where Weintraub said dogs managed to "smell these poor boys 12½ feet below the ground." Sturgis' mother posted on Facebook that "this was an act of pure evil. All we can do is continue to pray for our loved ones." DiNardo's parents, Antonio and Sandra DiNardo, own the farm in upper Bucks County, a bucolic area with rolling hillsides, new housing developments and historic sites. They also own a concrete company near their home in Bensalem, closer to Philadelphia. They were subpoenaed earlier on Thursday to testify before a grand jury. An attorney representing the couple issued a statement saying they sympathize with the families of the missing men and are cooperating "in every way possible with the investigation." 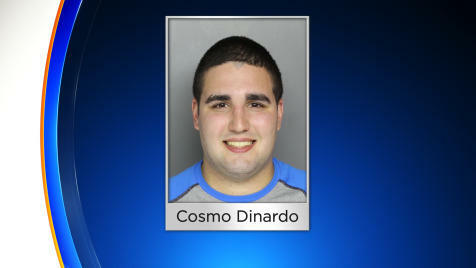 DiNardo was first arrested Monday and held on $1 million bail on an unrelated gun charge before his father paid $100,000 to bail him out Tuesday. The charge stems from accusations that DiNardo was caught with a shotgun and ammunition in February despite a prior involuntary commitment to a mental health institution.